So Many Good Things Happening at FHUHS Library/iMedia Center! This year has been a busy year, with the official launch of proficiency-based learning and grading, personalized learning, and so much more! 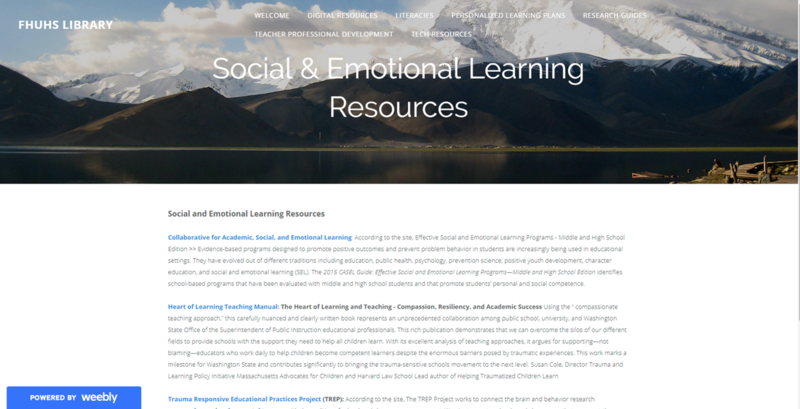 One of the things that we have been so busy with is a Social Emotional Learning project that I co-developed with English Language Department Chair Tricia Doran. Students read the book - The Curious Incident of the Dog in the Night-Time by Mark Haddon. I then created a Live-Binders full of authoritative information for the students, in regard to the various themes in the book. The students then chose a topic to research, based upon the themes the author addressed in the book. Students then used an adapted version of The Healing Library template, by Curious City DPW, to create a booklet, full of information on their topic of choice. The booklet includes specific information on a particular theme, such as depression, to include; the warning signs, a list of local counselors and activities to help community members cope with the symptoms. 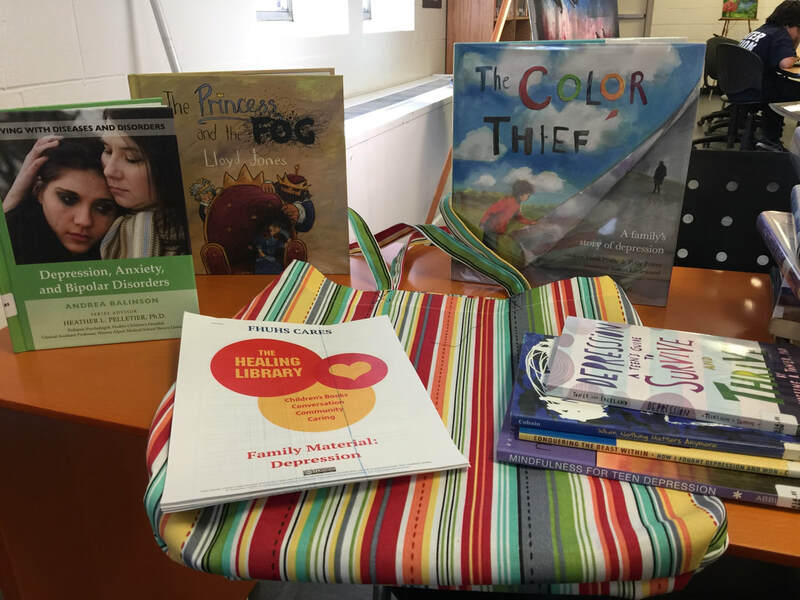 The booklet the students created will be placed into a cloth bag, that Family and Consumer Science, Jennifer Clement has had her students sew, along with a variety of books on depression (picture books, books for teenagers, and informational books for adults). These "kits" will be available to check out from FHUHS and local public libraries! 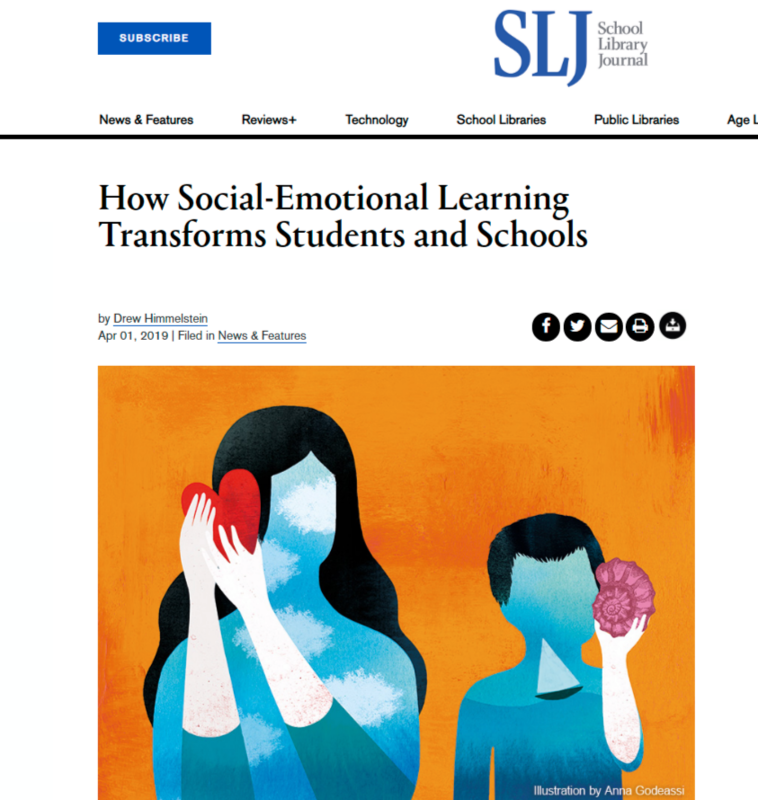 The project is featured in April's School Library Journal - How Social Emotional Learning Transforms Students and Schools. For more information on Social and Emotional Learning please see this web-page on the FHUHS Library website. The Slater Book club is currently reading two books simultaneously! Ready Player One by Ernest Cline and Me and Earl and the Dying Girl by Jesse Andrews! In the year 2044, Wade Watts, like the rest of humanity, chooses to escape reality and spends his waking hours in the limitless, utopian virtual world of the OASIS, but when Wade stumbles upon the first of the fiendish puzzles set up by OASIS creator James Halliday he finds he must compete with thousands of others--including those willing to commit murder--in order to claim a prize of massive fortune (OPALS Library Management System). Seventeen-year-old Greg has managed to become part of every social group at his Pittsburgh high school without having any friends, but his life changes when his mother forces him to befriend Rachel, a girl he once knew in Hebrew school who has leukemia (OPALS Library Management System). Both great books have been crafted into great movies. Please see the movie trailers, below. Please see me in the library if you would like to join us. There are a limited number of books, so hurry in to receive a copy! Free Summer Meals For Kids And Teens 18 And Under! To learn more, please see this flyer. If you have any further questions, please contact Ashley Bride (802) 265-3666. Have You Heard About Vermont State Park's FREE First Time Happy Camper Weekends? MONTPELIER, VT – Vermont State Parks is excited to launch the new First Time Happy Campers Program at five parks during the months of July and August. Created in partnership with the Outdoor Gear Exchange, this program provides free camping for new campers, whose names will be chosen at random when they register here. The program is designed to encourage families who haven’t camped before to give it a try. Participants will receive a free campsite, firewood, tents, camp stove, lantern and sleeping pads. If campers don’t have sleeping bags or don’t want to bring bedding from home, they can purchase sleeping bags online from the Outdoor Gear Exchange for a discounted rate of $34.95 for delivery to their home or pick up upon arrival at the park. On Friday night, campers will be met by friendly park interpreters who will show them around and help set up their camp, providing camping tips and support throughout the weekend. Campers can attend interpretive programs, check out free fishing gear and enjoy all the parks have to offer. Prior to the trip, participants will receive a packet containing a packing list and tips, meal and recipe ideas and other information to prepare them for their trip. Participating parks are Bomoseen, Button Bay, Grand Isle, Stillwater and Woodford. Interested campers can sign uphere and choose the park and weekend of their choice. Two families will be chosen each weekend with campsites located near each other, so they can meet other families new to camping. If many applicants choose the same weekend, winning entries will be selected at random (The Vermont Department of Libraries 2018). Please view the video below to learn more about Vermont State Parks. School Vacation Is Getting Closer & Closer! What Will You Be Reading This Summer? School is almost out for summer! Have you decided what you will be reading? If you are looking for ideas you are in luck, because Vermont School Librarians have selected, and suggested the following books for Kindergartners through grade 12! See the file at the bottom of this post, to download the brochure. Please see the video's below, to learn about the books and hear what selected authors have to say about their new titles! Proficiency-Based Learning & The School Library! Did you know that the American Association of School Librarians (AASL) recently released new National School Library Standards? They align perfectly with Vermont's Proficiency-Based Learning and Grading Initiative! Please see this post to learn more about the new standards. 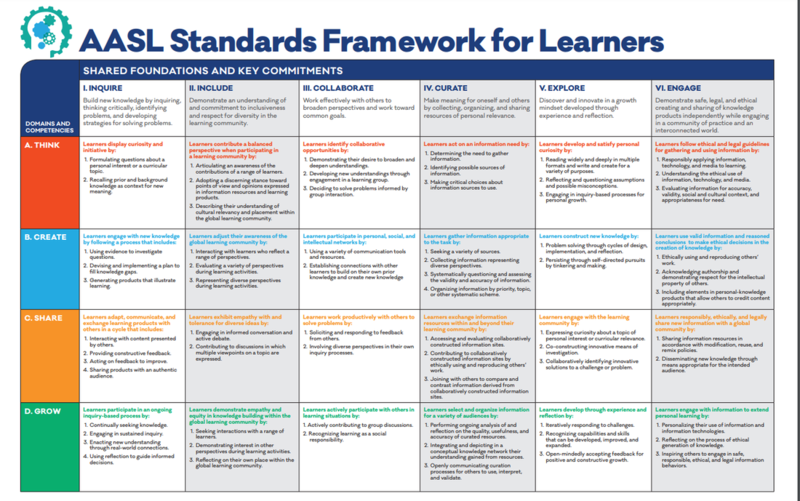 The new National School Library Standards support and align perfectly with Vermont's EQS Transferable Skills and recommended performance indicators. To learn more about AASL shared foundations, please click on image below. Did You Know That The Library Of Congress Has Added A "Susan B. Anthony Papers" Collection To Their Digital Collections Site? Yes, the Library of Congress has added a "Susan B. Anthony Papers" Collection to their Digital Collections Site! This is an amazing site for both students and teachers alike, to learn deeper about Susan B. Anthony, using primary source materials. Please view this collection here. ​"The papers of reformer and suffragist Susan B. Anthony (1820-1906) span the period 1846-1934 with the bulk of the material dating from 1846 to 1906. The collection, consisting of approximately 500 items (6,265 images) on seven recently digitized microfilm reels, includes correspondence, diaries, a daybook, scrapbooks, speeches, and miscellaneous items. Donated by her niece, Lucy E. Anthony, the papers relate to Susan B. Anthony's interests in abolition and women's education, her campaign for women's property rights and suffrage in New York, and her work with the National Woman Suffrage Association, the organization she and Elizabeth Cady Stanton founded in 1869 when the suffrage movement split into two rival camps at odds about whether to press for a federal women's suffrage amendment or to seek state-by-state enfranchisement. With the possible exception of her close collaborator Stanton, no woman is more associated with the campaign for women's voting rights than Anthony, whose name became so synonymous with suffrage that the federal amendment, which formally became the Nineteenth Amendment, was called for many years by its supporters as simply the Anthony Amendment." Join The National Geographic "Out of Eden" Walk Around The World! Join National Geographic Journalist Paul Salopek as walks around the world. Meet the people he has encountered along the way. Learn about other cultures through spectacular images, journal articles, and video recordings. But why is he traveling on foot? "Paul Salopek’s 21,000-mile odyssey is a decade-long experiment in slow journalism. Moving at the beat of his footsteps, Paul is walking the pathways of the first humans who migrated out of Africa in the Stone Age and made the Earth ours. Along the way he is covering the major stories of our time—from climate change to technological innovation, from mass migration to cultural survival—by giving voice to the people who inhabit them every day. His words, as well as his photographs, video, and audio, create a global record of human life at the start of a new millennium as told by villagers, nomads, traders, farmers, soldiers, and artists who rarely make the news. In this way, if we choose to slow down and observe carefully, we also can rediscover our world." You can read about his adventures and follow his journey here. To learn more how Paul's "Out of Eden" website can be used in your classroom, please view the video below. If you are a Foreign Language Teacher, or would like to view Paul's experiences in another language, please click here and proceed to the "Languages" drop down bar and select the language of your choice.